At The Way of The Witch, our primary goal is to ensure that everyone has access to the healing products and tools they need. If you would like to make any of our hand-crafted products at home, please contact productservices@TheWayofTheWitch.com and let us know which product(s) you are interested in. We will happily provide you with a recipe and instructions. Discover the power of true aromatherapy and potent plant energy work with our new line of 100% pure, organic, geo-energetically infused essential oils. Nourish your chakras with our delicious herbal tea blend. Formulated using the highest quality, organic herbs, Chakra Tea was developed to assist in creating optimal function of the enregetic body. Repair & rejuvenate your body from the outside in. Use this one-of -a-kind salve to facilitate healing rashes, cuts, broken bones & more. This carefully formulated herbal blend is designed specifically to enhance healthy immune function and boost the bodies natural defenses for those who are concerned about, suffering from, or recovering from cancer. Rejuvenate your skin and invigorate your senses with this all-natural, herbal liquid lotion! 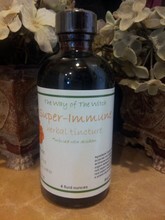 This exclusive formula works as a powerful natural antibiotic to boost the immune system & fight infections like influenza, strep throat, parasites, and the common cold. 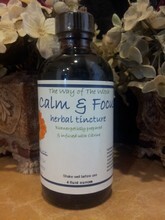 Calm and Focus can help provide all natural relief for ADHD, poor concentration, memory loss and more. This mindfully crafted herbal blend will help you compose and concentrate a restless mind. Re-energize your body and recapture your health with our nutrient rich, gently detoxifying herbal formula. Use this carefully selected herbal blend to help promote optimum health and bodily function. Be sure to check out the list of ingredients located on each product page for a detailed description of all the components and their benefits! Take a look at Tincture Making 101 for a guide to making tinctures at home! These exclusive, hand-crafted products, are mindfully created to enhance wellbeing and promote healing for a wide range of conditions. Made with only the highest quality organic or wild-crafted herbs, each batch is bio-energetically prepared during the appropriate moon cycle and geo-energetically infused with specific crystal energies to support health and balance on every level of the physical and energetic bodies. The products on this site represent some of our most highly sought after formulas. Used in both my personal and professional practice, they are created with the highest degree of care to help the user achieve ultimate balance and optimal health.